Kentucky farmers will likely benefit from the affiliation between the University of Kentucky and food delivery giant Aramark. Officials announced Tuesday a new project within the public-private partnership. 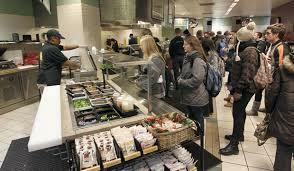 The "Food Connection" initiative at UK is backed by a $5 million investment by Aramark. Officials say $1 million will be set aside to endow undergraduate and graduate internship and fellowships and $250,000 annually will be spread over 15 years for staff, programming, and research grants. The plan calls for local growers to supply lots of produce to UK. "Well we can use as much as can be produced. I mean our commitment is to try to source as much as is possible. I mean, there are opportunities and again, as we form the partnership now in the connect program, that's something that we'll be looking at," said Aramark CEO Eric Foss. The Food Connection office will be housed inside a new dining and student support facility, scheduled for groundbreaking later this month. Nancy Cox, Dean of UK's College of Agriculture, says a recent Louisville survey found a gap in the amount of available local produce and the amount needed. "They're providing Louisville consumers with $300 million dollars' worth of local food and the consumer demand is $800 million dollars' worth of local food. That figure was given by Louisville Mayor Greg Fisher recently. So, if we extrapolate to the UK campus and the Lexington community, we probably have a long ways to go to meet the local demand for food," said Cox.